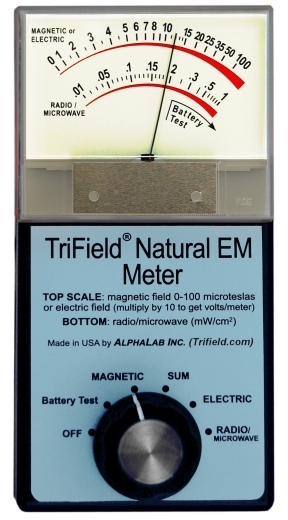 The TriField Natural EM Meter was designed to do field measurements for special research. It detects changes in extremely weak static (DC or "natural") electric and magnetic fields and signals with both a tone and the movement of a needle-type gauge if either the electric or magnetic field changes from previous levels. A radio and microwave detector is also included, which reads radio power directly. Because man-made AC electric and magnetic fields are very common and could interfere with readings of static fields, the meter has been designed to ignore AC fields. Normal construction materials don't block magnetic fields, so the meter can be placed indoors and will work equally well, and due to the built-in tone, it can be used in the dark, and will sound the tone at whatever level of field the user sets. Model 1 operates on a standard 9-volt battery, and Model 2 runs on a 9-volt battery or an AC adapter (both included). Model 2 has an input jack for an optional high-sensitivity magnetic coil. Both models are covered by a one-year warranty. The meter is sensitive to changes of as little as 0.5% of the strength of the Earth's magnetic field, and the tone will sound whether the field increases or decreases. Model 2 is sensitive down to 0.05% of the Earth's magnetic field when the optional external coil is used. After the meter detects an event, when the magnetic field then becomes stable for more than about five seconds, the tone will stop and the needle will return to zero. The meter will remain at rest until the field changes again. The threshold level (squelch level) of the tone is adjustable. The user determines the amount of change in the magnetic field required to sound the tone. If the field changes by the threshold amount, the tone will come on at a low pitch. If the amount of change is larger, the tone's pitch will be higher. 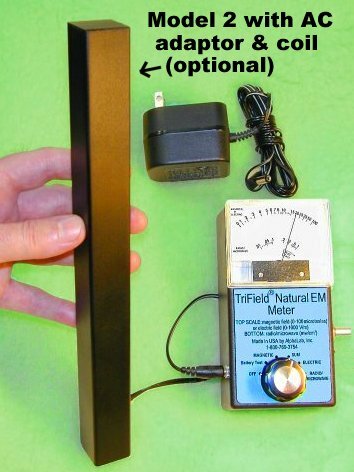 This meter can also be used to determine if anything is magnetized. For example, if a bed frame is magnetized, the meter can be held vertically and slowly be swept by hand over the bed. Any changes in the direction or strength of the magnetic field will register. A similar process can reveal the presence of magnetic rocks just below the ground. The Natural EM Meter can detect geomagnetic storms caused by unusual solar activity interacting with the ionosphere (which results in rapid changes of up to 10% in the Earth's magnetic field), as well as the electrical activity of ordinary thunderstorms. It will signal the movement of any distant, strong magnetic sources in the sky, even if the sky is cloudy or the source dips behind a hill. Ball lightning should in theory be associated with a strong magnetic field, and magnetization of metal on the ground has been reported with some sightings of unusual lights in the sky. When the dial is set to ELECTRIC, the meter is sensitive to electric fields as weak as 3 V/m (volts per meter). Indoors, electric fields typically fluctuate 1 or 2 V/m. By setting the minimum sensitivity to change at 3 V/m, we have designed the meter to disregard this "background noise". A 3V/m field is so feeble that if a 10'x10'x10' room were filled with a field of this strength, it would contain the total amount of energy equivalent to that required to lift a single grain of table salt 1/50th of an inch. Human beings and animals usually emit an electric field which is easily detectable using the Natural EM Meter. In fact, the meter can be used as a motion-activated intruder alarm. It is so sensitive that it can detect the presence of a person through a wall. Though it is not foolproof in this capacity, (sometimes a person will carry no electric charge and thus be "invisible" to the meter), its sensitivity is of interest to researchers in the field of parapsychology. Every type of detectable physical manifestation requires a certain amount of energy. For example, "moving air" requires the expenditure of a small amount of energy to get the air to move initially. Below is a table showing several types of effects or fields emitted by people and objects. It also shows the minimum amount of energy required (per cubic foot of air) to set up that effect or field so that it is stronger than typical indoor "background noise" for that effect or field. Clearly the static electric field is the type that requires the least energy to be detectable. Are instruments needed to detect this? The radio/microwave detector is sensitive from 100,000 to 2.5 billion oscillations per second (100 KHz to 2.5 GHz) and can detect strong or unusual atmospheric electrical activity. It can also detect leaky microwave ovens, cellular or portable phones, walkie-talkies and concealed surveillance bugs. Its minimum and maximum detectable signal strengths are 0.01 milliwatt/cm2 and 1 milliwatt/cm2 respectively. The SUM setting in Model 1 adds together the electric and magnetic fields and detects if either field changes. Model 1 is used to find a disturbance in either type of field, but in the SUM setting it can generally detect if a person approaches to within five or ten feet, even on the other side of a wall. For this reason, Model 1 is preferred for parapsychological research, when, for example, a room to be measured is known to be vacant for an extended period (except for experimenters, who remain relatively still for that period). In Model 2, the SUM setting is magnetic plus radio/microwave (which requires somewhat more battery power to operate than the Model 1 SUM, but Model 2 also has an AC adapter). The SUM setting in Model 2 is for early warning of any unusual atmospheric electromagnetic activity, such as geomagnetic storms or ball lightning. In this setting, it does not falsely trigger when people walk by. *Minimum resolution is 1/200 of full scale. Purchasing The Natural EM Meter, Then Please CLICK HERE. Ordering The Natural EM Meter, Then Please CLICK HERE. Reading MORE Information About EMR And EMF, Then Please CLICK HERE.